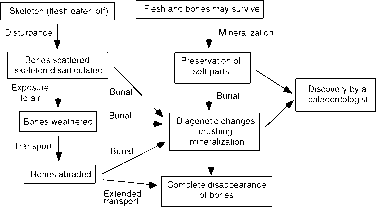 The mode of burial and preservation of fossils, their taphonomy, is important in their interpretation. The BBC series, Walking with Dinosaurs, was the most successful science documentary series ever made: since 1997, it has been seen by over 200 million people in nearly every country in the world. The series of six programmes was conceived by Tim Haines a few years after he had seen Steven Spielberg's Jurassic Park(1993), in which a clever mix of computer animation and models gave the first glimpse of what might be possible. Older dinosaur films had used plasticene models or lizards with cardboard crests stuck on their backs. Haines reasoned that the new computer animation techniques would allow him to make films about dinosaurs that would be so lifelike that they were like wildlife documentaries. There were six programmes: the Late Triassic of North America, the Late Jurassic dinosaurs of the Morrison Formation, the Late Jurassic marine reptiles of Europe, the Early Cretaceous of Australia, the Early Cretaceous pterosaurs of Brazil, and the latest Cretaceous of North America. In each programme there were six or seven featured organisms. Each of these was studied in depth by consultant palaeontologists and artists, and a carefully measured clay model (maquette) was made. This was the basis for the animation. The maquette was laser scanned, and turned into a 'stick model', which could be moved in the computer to simulate running, walking, jumping, and other actions. 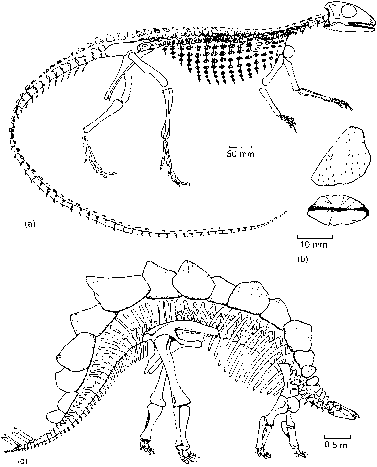 All aspects of locomotion and feeding were developed in consultation with relevant palaeontologists from all over the world. The story board was planned in detail for each programme and, while the models were being developed, BBC film crews went round the world to film the background scenery. Places were chosen that had the right topography, climatic feel, and plants. Where dinosaurs splashed through water, or grabbed a branch, the action (splashing, movement of the branch) had to be filmed. Then the animated dinosaurs were married with the scenery in the studios of Framestore, the company that made the computer effects. This is hard to do, as shadowing and reflections had to be added, so the dinosaurs interacted with the backgrounds. If they run through a forest, they have to disappear behind trees and bushes. The programmes were controversial. Some palaeontologists argued that the whole concept was improper as it mixed movements and behaviours for which there is strong fossil evidence with imagined colours and sounds. They were right, but boring. Most palaeontologists celebrated the accuracy and beauty of the work, and were glad that 200 million people had had the chance to see the results of their labours. Find out more at http://www.bbc.co.uk/dinosaurs/ and my accounts of how palaeontologists worked with film producers to make the series, as well as a defence of the whole enterprise, at http://palaeo.gly.bris.ac.uk/dinosaur/walking.html. Fig. 2.5 Taphonomic processes affecting a fossil vertebrate, from death, through scavenging and decay, through transport and burial, to eventual discovery by a palaeontologist. apatite. In rare cases, when decay is prevented, soft parts may be preserved. Vertebrate bodies decay as they are valuable sources of food for other organisms. When large animals feed on the flesh of a dead vertebrate, the process is termed scavenging, and when microbes transform the tissues, the process is termed decay. In terrestrial settings, carcasses may be picked over by large scavengers such as hyaenas and vultures, and when they have had their fill, smaller animals, such as meat-eating beetles, may move in. Similar processes occur under water. The style of decay by microbes depends on a variety of chemical conditions, particularly the supply of oxygen, the pH, the temperature and the nature of the organic carbon in the carcass. Decay may be slowed down in the absence of oxygen, for example on the deep sea-floor, or in a stinking black pond. In such conditions, whole fishes and other animals may be preserved relatively intact. Acid conditions, as are found in peat bogs for example, may also prevent decay. Well-known examples of vertebrates preserved by acid conditions are the famous 'bog bodies' of northern Europe, human remains that are preserved in their entirety, even if the bones may have dissolved and the flesh is somewhat leathery. Most soft tissues are made of highly volatile forms of carbon, in other words materials that decay readily. Less volatile forms of carbon may survive for longer. Certain vertebrates are found in situations of exceptional fossilization, where early mineralization has preserved even the soft tissues. Typically, the soft tissues are replaced by pyrite, phosphate, or calcite. More unusual examples include preservation in amber, in ice, or in asphalt. Examples of exceptional preservations are described later in the book (see pp. 9,86,269). 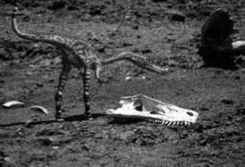 In more normal situations, where scavenging and decay have taken place, the surviving hard parts are usually transported by water or wind to their final resting place. Transport processes (Figure 2.5) generally disarticulate skeletons, that is, break them up. Further transport frequently causes fragmentation or breakage, and abrasion, when angles and sharp projections are worn down by physical processes (Figure 2.6). observed in cut sections of fossil bone. Compaction during uplift or folding of the rocks may further distort or compress fossils. These are examples of diagenesis, the physical and chemical processes that occur within sediment or rock.